Prime, seal and stick many types of surface with PVA glue at Toolstation. We stock PVA glue from only the best glue brands, including Unibond PVA, Everbuild PVA and Evo-Stik PVA. 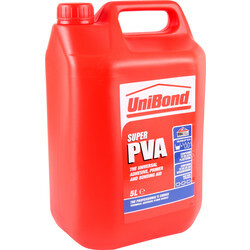 Unibond PVA is renowned for being the only BBA accredited PVA in the UK, and we stock Unibond super PVA with a high bond strength for gluing ceramic tiles, carpets, plaster and much more. The PVA glue can be dilated up to 5:1 with water for maximum use. We stock Everbuild PVA, ideal for use as a contractors PVA due to its high strength. 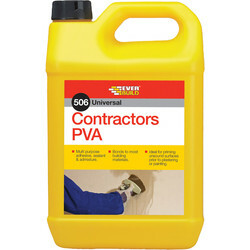 Find Everbuild 506 contractors PVA, a multipurpose water based PVA glue that can be used for priming and sealing porous or dusty surfaces. 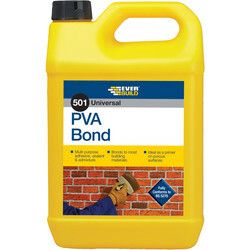 Alternatively, choose Everbuild 501 PVA bonding agent, a water based PVA glue with high solid content. 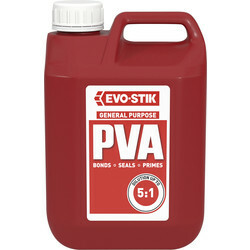 For plastering, rendering, sealing or dust proofing, Evo-Stik PVA is an excellent primer and works on most surfaces. It can also be used as an admixture to improve workability and adhesion. Receive free delivery when you spend £10 online or click and collect items from your closest Toolstation branch.